How to use colours effectively in scientific figures? An example of a scientific figure using colours randomly. As many as seven colours are used, with same level of intensity (red, blue, yellow, orange, violet, green, magenta). The outcome looks… colourful. The downside is that this colourfulness does not help carry your scientific message. At this level of colour intensity and abundance, there is no hierarchy and no more distinction between elements. This image could be in black and white instead and the level of information would be exactly the same. use spot colour: highlight in colour only the elements that really constitute the core of your message. Keep the rest of your image in grey scale. This is a very powerful way of using colours. The figures use three colours: red, orange and blue. Additionally shades of red, blue and orange are employed. Both figures highlight in particular the elements in intense red, orange and blue with secondary elements being paler and appearing to be in the background. 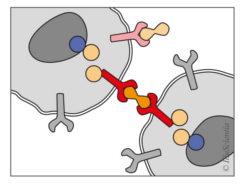 However the figure on the left seems to focus mainly on the two receptors connected via a common ligand due to highlighting in red and orange. 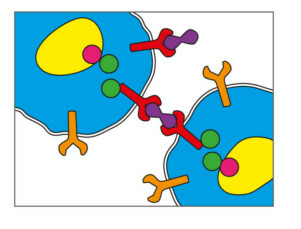 The figure on the right also draws attention to the outcome of this connection and the reaction in the cell nucleus. This figure uses spot colours. Colouring only some elements and keeping the rest in grey scale can actually be the most effective way of highlighting chosen elements in figures.